Adorable cottage on Route 6A, 'The Old King's Highway', in the picturesque village of Cummaquid, Cape Cod. Ideal for two, combination living room, bedroom, kitchen with separate bath with shower, outdoor barbeque, cable TV, internet. Situated at the foot of the owner's 13 acre property. Walk across the street and take a stroll to a quiet bay side beach through the fields of MA Audubon’s Long Pasture Wildlife Sanctuary.Close to shops and restaurants in Barnstable and Yarmothport Villages, as well as beaches, whale watching, golf, and art galleries. Great area for walking, biking and kayaking. Adorable and immaculate little cottage in a very convenient location. We’ve already reserved it again for the fall! It was a pleasure to stay at Mrs Maggie's property. The cottage is very cozy. Well decorated. We loved it. Two Thumbs UP^^. We will come back for sure. 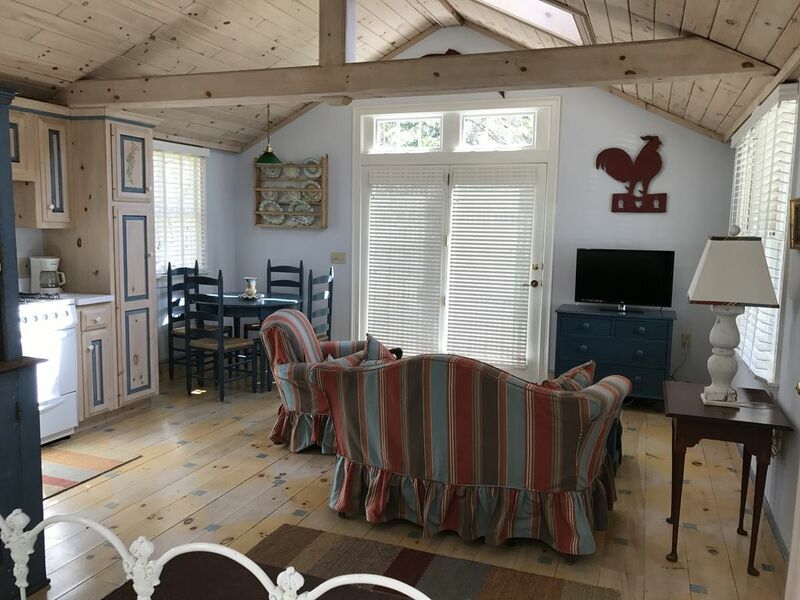 Cozy Cape Cod cottage in a great location! We thoroughly enjoyed our stay in this adorable home. The owner, Maggie, is very pleasant to work with and keeps her property in great shape. Being fellow VRBO owners in the Virgin Islands, we greatly appreciated the work we know that goes into keeping a property in excellent condition. We would recommend this listing highly. Thank you, Maggie, for a lovely stay! Immaculately clean and so comfortable! We used this place to be a home base while we explored the cape...just at the of the driveway, 6A is the route to see everything from Provincetown to Falmouth. The house is charming andcozy, has everything you need! Maggie has just the right amount of “hands on”, but we stayed one full week and didn’t contact her because everything was just right! Nice shower, comfortable bed, lots of natural light...we saw the moon from the skylight over the bed! Everything is close by, so many places to eat great meals, stock the fridge or shop for cool stuff. When we return, we will try to stay here again...after a long day of exploring on the Cape, we felt like we were coming home! Very bittersweet to leave this adorable place. The cottage was well equipped and in a good location to explore Cape Cod via day trips. As previously noted in other reviews, the road noise starts early. The only suggestion I would have is for the host to include an information packet with basic information. Easy to find. Great location with easy access to sights. Clean property, quite well equipped so self-catering possible. Cottage is located on RT 6A, selected as one of USA's most scenic drives by National Geographic. Noted for quaint New England villages and antique shops. Property is mid-cape and close to beaches, nature preserve, resturants, shopping, whale watching, golfing and biking. Golf courses are everywhere. Mass Audobon nature preserve trails begin across from property. Heritage Plantation gardens and museum is nearby. Cape Cod Rail Trail starts 2 exits up the highway (Dennis to Wellfleet). We are about 70 miles from either Boston or Providence and about 45 miles from Provincetown at the tip of Cape Cod. There is a local Airport (Barnstable Airport) about 5 miles away and buses from New York, Providence and Boston are 3 miles away. Ferry's to Martha's Vinvard and Nantucket are 4 miles.